First of all, I know after reading the headline your mind will automatically tell you "Its either in computer village or Aba" but guess what, it didn't even happen in Nigeria. Someone just shared her ordeal on Black Friday. 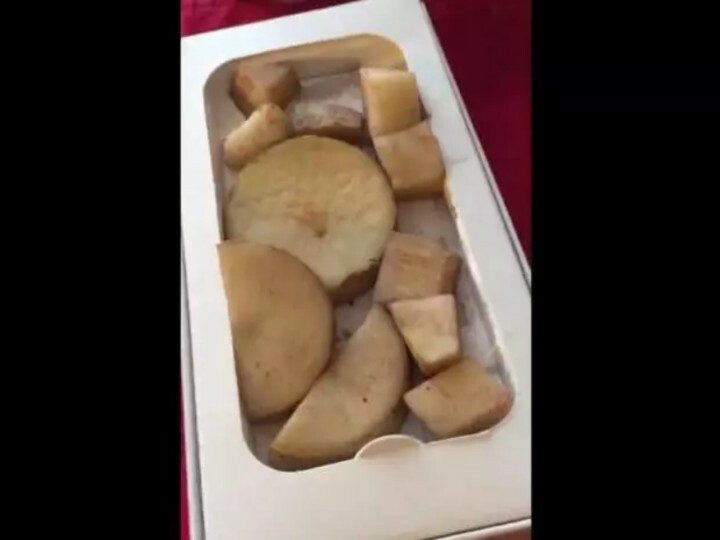 A woman claims to have been ‘tricked’ after buying an iPhone 6 in a Black Friday deal and somehow getting a box of potatoes instead. While the annual Black Friday sales can be a golden opportunity to grab a bargain, the woman from Wisconsin also found they're a great opportunity for scammers and conmen to strike. In a viral video originally posted on LiveLeak, the unknown woman says she saw a black truck with balloons and Black Friday posters driving around her neighbourhood in Milwaukee. She says the vehicle was filled with gadgets, clothes and accessories, and she thought she’d struck a bargain when the driver agreed to sell her the phone for just $100 – around £80. But when she got home, she says she was horrified to find she’d been swindled and the box was actually filled with 11 chopped pieces of potato. “He hands me an iPhone 6, I’m playing with it, turning it around, checking it. “I ask him to call the phone and he showed me the number and I’m like, ‘Cool, it’s legit. It’s ringing. It’s working. I want it.’ “Right? Wrong. He turns around and puts the phone in the box with a piece of paper, he hands it to me, I hand him the money, I get in my car and drive home. And to add apparent insult to apparent injury, the scammer packed an Android charger in the box with the potatoes. It is unknown what device the woman used to film the evidence of her apparent scam before it was uploaded to LiveLeak. UK consumer watchdog Which? said to get the best deals on Black Friday, shoppers had to prepare thoroughly, research products beforehand and be wary of unusual brands.